This is Carl Young's bio on the Discovery Channel website: "Although Carl is a native Californian, he was called east in 2000 after a spell working on Hollywood film crews. He decided to take off on a two month storm chasing adventure in the Great Plains hoping to catch a glimpse of a few tornadoes but ending up with over a dozen twister encounters. Experiencing the raw force of nature in Nebraska was unlike any pyrotechnic display on a high-tech Hollywood set! This inspiration led Carl to the study of tornado dynamics and ultimately a master's degree in atmospheric science from the University of Nevada, Reno. 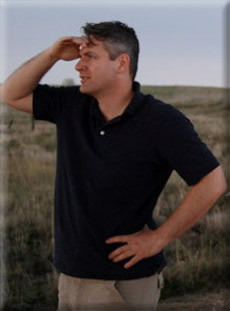 While attending a meteorological conference, Carl met Tim Samaras who encouraged him to collect meteorological data from inside tornadoes as the principal focus of his thesis research. Every spring since 2003, Carl has headed out with Tim, and together the team has tracked down over 125 tornadoes. "Carl's finest moment came on June 11, 2004, near Storm Lake, Iowa. Working with Tim, they defied the odds and deployed their probes right in the path of a tornado. The six-camera video probe captured amazing footage from multiple angles while the sensor probe recorded data that revealed just how fast wind speeds are close to the ground. Since then Carl remains eternally optimistic that they can repeat the same feat despite the huge challenges for successful deployments." Young taught geology on occasion at Lake Tahoe Community College. He was one of the school's distinguished alumni. He earned a bachelor's in economics at Cal and a master's in atmospheric science at UNR. He worked for a while at the League to Save Lake Tahoe on the program team. "Carl was a very good analyst and passionate about Lake Tahoe and doing the right thing to protect the environment. He had lot of integrity and concerns for things being done the right way," John Friedrich told Lake Tahoe News. Friedrich hired Young. Young took over as program director at the League when Friedrich left. "Carl did lot of good for Lake Tahoe and the world. He wanted to make the world a better place and gave a lot of himself to make things better," Friedrich said. "I knew Carl well and as a matter of fact over dinner one night at our house he claimed that the Tahoe Twister motivated him to go back to school, study meteorology, and inspire him in his life's passion. This is an honor ( I think)"
Link to this NBC NEWS article and slideshows. 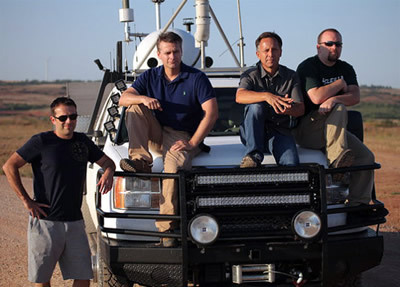 Weather scientist Tim Samaras, his son, photographer Paul Samaras, and meteorologist Carl Young were killed by a powerful tornado that struck Oklahoma City over the weekend. NBC's Mark Potter reports, and The Weather Channel's Mike Bettes tells TODAY's Al Roker about narrowly surviving the same storm. "As soon as I felt the vehicle tumble, I knew we were in trouble," Bettes said Sunday on TODAY. 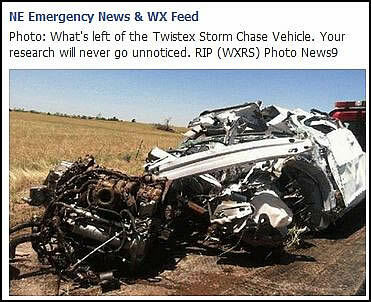 Carl Young of South Lake Tahoe died May 31 chasing a tornado in Oklahoma. The three died while tracking the EF3 tornado that ripped through El Reno, Okla., on May 31.